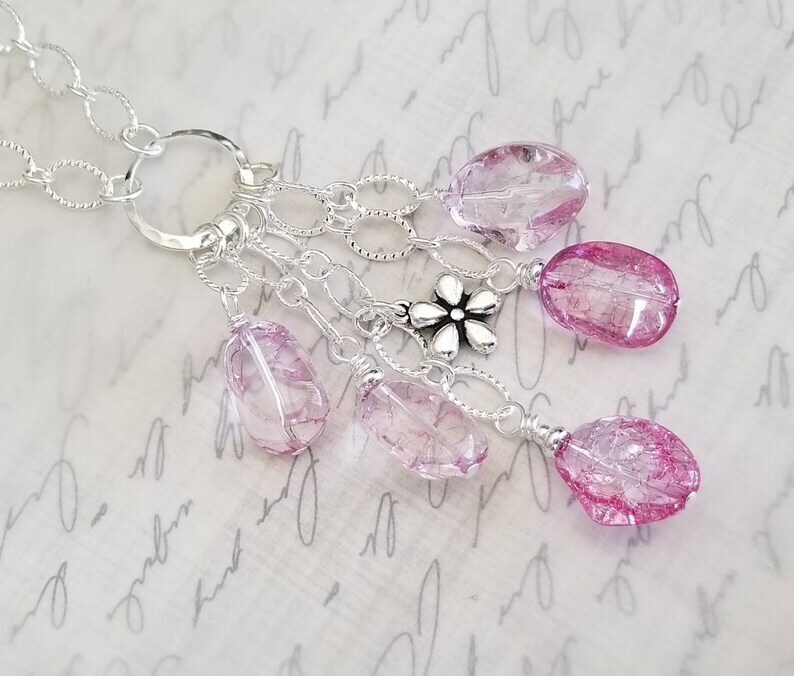 Love these fascinating pink glass beads!! Can you see the natural lines in the glass? I wired each bead in silver and hung from shiny silver textured links and dangled from a hammered silver 15mm ring. And just for fun added a daisy (feel free to ask me for a different charm!) The ensemble is so fun and falls a hair below 3 inches. I wired to silver plared copper textured chain for a long groovy swingy feel! These beads have a lovely eye-catching sparkle. Perfect for summer outings, that spring feel or even dressing up your jeans every day. Add on coordinating earrings below. Ionly have enough beads for two sets!! Special offer details: April showers bring May flowers. Here's to longing for flowers with a fun Spring oriented sale. All pieces marked! Free shipping details: I'm always looking for a free shipping deal! I think that's why so many of us use Amazon. So, I am extending to you free domestic shipping when you purchase and 3 or more items at a time. Have fun and enjoy! !